Many years ago there was a peaceful village on the edge of a great forest, that was plagued by a terrible creature. This beast would sneak into the village at night and randomly pick a person sleeping quietly, and take this person off into the forest where he would kill the person then drink his or her blood. The village’s eldest hunter and trapper devised a plan to rid his people of the beast by digging a large pit trap. The village teamed up to dig and hide the trap then they waited. After a few nights the village was awakened by a terrible roar, and discovered that they had caught the beast. Everyone in the village then gathered all the dry wood they could find and threw it into the pit with the beast and then set flame to it. The fire grew so great that it could be seen from the horizon, and soon many thousands of embers began to float up from the fire and scatter to the winds. The villagers felt good about what they had done until they discovered that each of the embers had transformed into tiny versions of the blood hungry beast. And, this is how mosquitoes were created. The story above is an old Native American story that I read somewhere many years ago, and have paraphrased. It was one of my children’s favorite campfire stories when they were little, and they still ask for the “mosquito story” whenever we are near a campfire. They never actually believed it was true. Who would these days. After returning home from yet another failed quest to find immortality our hero Gilgamesh is told about a plant growing in a wonderful garden whose leaves, when prepared properly, can provide an elixir that will restore one’s youth, thereby making them immortal. Gilgamesh goes in search of this plant and eventually finds the last one. However, while on his return trip Gilgamesh spies an inviting pool and stops to bathe in it. He leaves the plant on top of his clothes on the bank of the pool, and when he isn’t looking a serpent sneaks up and swallows the plant. The serpent then sheds his old skin and reveals a young smooth skin, thereby stealing the immortality of renewable youth for himself. This is why snakes shed their skin and are continually reborn, while man must grow old and die. So, who could believe such fairy tales about why things are as they are? Well, primitive people exhibiting those wonderfully human traits of wonder, and desire to know, which eventually led us to all of our wonderous scientific discoveries and knowledge used their imagination and what knowledge they had at the time to develop these stories, and many others, as a way to explain the universe around them. As time went on and the reality of where mosquitoes come from, and why snakes shed their skin were learned such stories fell into the realm of children’s stories and fairy tales…for the most part. The Epic of Gilgamesh, from which the story above is drawn, is a collection of stories about a legendary Sumerian king from the third millenia BC and are the oldest known works of literature. These stories, which are based on older stories, were written at least 1,500 years before the early texts which would become the Bible, and were quite well-known throughout Mesopotamia. 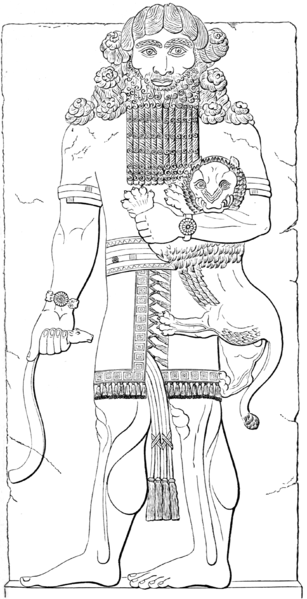 There are many correlations between the stories of Gilgamesh and the later biblical stories such as: the creation of sky and earth from one being (Genesis 1); a man created from clay who is tempted by a woman, accepts food from her, covers his nakedness, and then is forced to leave and never return to his place of residence (Genesis 2-3); the loss of immortality due to a serpent (Genesis 3); a great flood which kills everyone except for a select few (Genesis 6-8), at the end of which there is a sweet-smelling burnt offering which pleases the gods (Genesis 8); and many more. When these stories, whether in their original Sumerian version, or later plagiarized Israelite versions, are read today by any modern, educated, adult, that person would clearly see that they are fairy tales from ancient times, used by men ignorant of modern scientific discoveries as a way to explain the World around them and add legitimacy to their chosen god or gods. We all know that only children believe fairy tales…Right? This entry was posted in Where Did Bible Stories Come From and tagged Adam and Eve, Bible, Book of Genesis, campfire stories, Fairy Tales, Garden of Eden, Gilgamesh, Gilgamesh Epic, Mesopotamia, Noah on December 7, 2013 by Atheist Ron.